The EHRI Seminar for Holocaust researchers Languages, Cultures and Perspectives – How to Read Holocaust Sources took place in Vilnius, Lithuania in the premises of Vilna Gaon State Jewish Museum (VGSJM) and was organized by Kamilė Rupeikaitė and Neringa Latvytė-Gustaitienė from VGSJM together with Giles Bennett and Andrea Löw from the Center for Holocaust Studies at the Institute for Contemporary History in Munich, Germany (IfZ). It was the first of approximately ten Methodological Seminars EHRI will conduct in the next few years. In total, more than 30 applications were sent to the organizers, and 12 motivated researchers and archivists from Austria, Belarus, Belgium, Greece, Israel, Latvia, Lithuania, Moldova, Norway, Poland and Romania were chosen as participants. 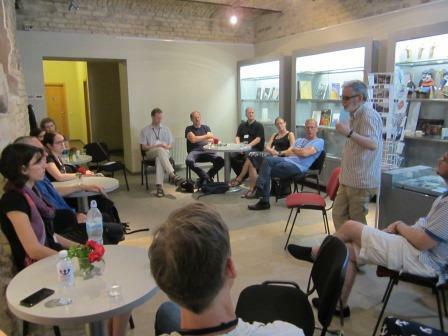 The participants brought together different experiences and perspectives on Holocaust research, as well as archival and museum collections, allowing for a mutually enriching broadening of horizons. Two keynote speakers were invited: one of the leading experts on the Holocaust in Lithuania, Dr. Christoph Dieckmann from the Fritz Bauer Institute (Frankfurt am Main, Germany) opened the seminar with succinct insights into the tasks of a researcher regarding the reading of Holocaust sources, and Dr. Lara Lempert from Vilnius University and National Martynas Mažvydas Library – one the leading researchers of Lithuanian Jewish history and culture – presented recently unearthed YIVO-related documents of the Vilnius Ghetto. Other invited speakers broadened the knowledge of the participants regarding the state of Holocaust research: They focussed on the relevance of the recently fully published Rosenberg diary for the understanding of the dynamics of power in the central Nazi leadership and the Holocaust (Frank Bajohr, IfZ) as well as on the interpretation of bureaucratic processing marks on administrative documents in order to understand their genesis and the involved decision making (Nicolai M. Zimmermann, Bundesarchiv, Germany). Laszlo Csősz gave an overview on the development of Holocaust research and scholarship in Hungary. Attention was also given to the peculiarities and rewards of researching in archives of religious organizations, state enterprises and education institutions (Neringa Latvytė-Gustaitienė) and to visual art (Dr. Vilma Gradinskaitė, VGSJM) as a supplementary source for Holocaust studies. Giles Bennett presented the content and use of the EHRI Portal as a useful tool for the participants’ research. In the program, time was allocated for participants to present their own research projects, which generated great interest and engaging discussions. 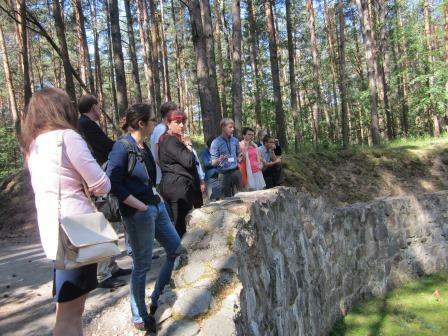 The program was well balanced with lectures, discussions and field trips – participants had a guided tour in the Vilnius Ghetto (Ilja Lempertas), and attended the Paneriai mass killing site with a guided tour there (Mantas Šikšnianas). 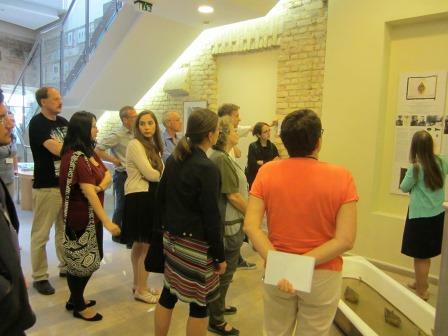 They also visited the permanent exhibitions of the Tolerance Center and the Holocaust History Exhibition of the VGSJM (Irina Pocienė and Danutė Selčinskaja), and were able to enjoy tours of the Lithuanian Central State Archives and the Collections Department of the VGSJM, where they had the chance to see some unique Holocaust related documents (for example, posters of the Vilnius ghetto) and objects. During the final session, constructive remarks and suggestions for future seminars were shared. Most of the participants were very satisfied with the program, the organisation and mutual interaction during the seminar. 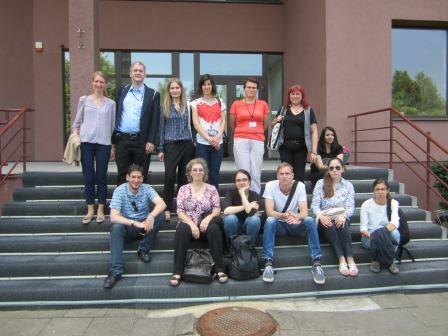 To sum up, the seminar topic was very relevant, and problems which researchers experience in East European countries (e.g. Lithuania, Latvia, Hungary, Romania, Poland, Moldova) are similar: attention to Holocaust research and access to archival sources is not sufficient, and there are not enough specialists. The seminar showed the need for such events, as participants actively took part in all the activities of the seminar, and expressed the wish to stay in touch with each other also after the seminar. The seminar proved to be very useful for their professional work. Would you like to particpate in an EHRI seminar or workshop? 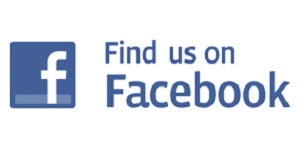 Look here for our seminars and workshops programme.